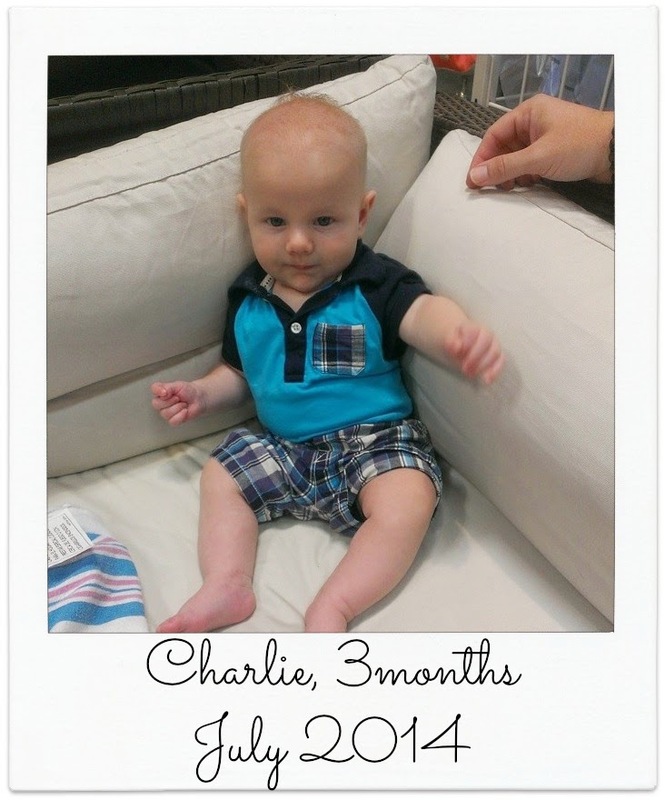 May the Schwartz Be With You: The Schwartz's vs Charlie's 3 Months Old! Charlie you are now 3 months old. You actually turned 3 months old while we were on the second leg of our trip to Florida so there is no nicely staged picture of you on your "month-day". In fact, this is just a cell phone shot from our trip to Ikea. What can I say, third kid problems son. As it is your 3rd month and no doctor check up I can't tell you how much you weight or how tall you are now. All I can say is all of a sudden you seem so big to me. I was carrying you in my arms across my chest at Disney and in that moment I finally realized how big you've gotten. You took up my entire frame from elbow to elbow from head to bum and your legs were hanging out over the end of me. * I am cramming you into the last size 1 diapers. You are definitely ready for 2s. * All of your 0-3 month and 3 month clothes are packed away. You wear 3-6 month now. * You stay awake for nice long stretches during the day. You catch a small cat nap in the morning. Take a great afternoon nap in the 1-4 time slot that the other kids nap (you usually go down between 1:30 and 2 and get up at 4). Then another cat nap in the evening. And go down for the night at 8. * You are still very laid back and go with the flow. I've heard third kids are just like that, but I don't believe that. I think it's just your personality. * You love Sarah and Cody and are completely content to be left on the floor of the room they are playing in. You smile real big when either of them gets in your face to talk to you. * You are starting to be to busy to nurse. You only want to snack and then get mad at me if I try to make you eat for more than 5-10 minutes. This, of course, is causing huge anxiety for me and I'm dreading our next check up. * You love to smile and talk to anyone that is talking to you. You don't mind being passed around a room. You'll either eventually fall asleep on whoever is holding you or fuss just enough to get back to me and then promptly pass out. If there is anything I want to say about you Charlie, it is that you have healed my heart. It is no secret that Cody was a rough baby. I loved him dearly but he broke me. I was done after him and didn't want to roll the dice again. I basically broke out in hives when other babies were near me. And there was no way I wanted to hold any one else's bundle of joy. I actively avoided babies after him. But here you've come to be apart of our family and I look at you and your calm disposition. Your quick smiles, and easy coos and I get it finally. I get why people love babies. I'm enjoying having your tiny self in our home more so then I did the first time around cause I didn't know what I was doing, or the second time around because there were so many hurdles. Maybe it's because you're the last that I'm so nostalgic over ever nuance of you, or maybe it's because I finally got "an easy baby". I'm not sure what it is. But I am truly thankful for your sweet nature and laid back personality. I joke if you'd had been the first I'd have 20 kids. But instead, I'm thankful that you're (hopefully) the last and a sweet high note to end this part of my motherhood journey. Now, let's hope you keep this easy personality going into your teenage years because I'm pretty convinced your sister is going to be the death of me. Aw, sweet handsome little Charlie. I just love it when he gives me a big gummy grin. He is so cute. I guess this answers my Disney question. What a sweet sweet baby. I cant wait to meet him! Im so glad youre enjoying his babyhood. I was most comfortabke and really felt i got a handle on things at 3 kids. I love your last line about Sarah. Lol, she's a hoot. If there is anything I want to say about you Charlie, it is that you have healed my heart. ---> I think that's absolutely beautiful.